“Love Your Heart”, reads the back cover of the May/June 2010 issue of Synergy Magazine. It’s not an unexpected mantra to be found on the pages of Synergy, however, this particular instance was not of an expected nature. It was a slogan for one of the largest manufacturers of food and household products in the world – Unilever, and their Becel line of margarines. With Unilever having now had the opportunity to promote their new ‘Vegan’ margarine to Synergy readers, it’s only fair that Synergy provide some balance to the ad, and more specifically, pose the question, “how much ‘heart’ is this company working with”? Upon deconstructing Unilever’s marketing strategies, it doesn’t appear much at all. Instead, deception appears to be their primary strategy. According to the company, Unilever is the leading ice cream producer in the world (although primary competitor Nestlé might argue the claim). Both dominate the world ice cream market. In 1993, Unilever purchased the Breyers and Sealtest brands from Kraft and later introduced the Breyers brand into Canada in 1995. Today, Unilever controls 25% of the Canadian ice cream market (Nestlé another 25%). Since the Breyers line of products was introduced into Canada, Unilever has progressively replaced most of their products’ base ingredient of milk and/or cream with what are known as milk ingredients, modified milk ingredients and/or vegetable oils. While the ‘Classic’ line and its familiar blue containers were once made with real milk and cream, that’s no longer the case, and with the containers having never changed, the public was left not any the wiser! Retailers or customers who might have noticed any changes in consistency or flavour were only informed about the ingredient shift upon contacting the company. Perhaps most shocking has been one particular change seen through the lens of Canadian labelling laws. While Breyers has long been recognized as a brand of “Ice Cream” products, according to Subsection 5(1) of Canada’s Food and Drugs Act, most Breyers products are no longer legally permitted to be labelled “Ice Cream”! In order for a product in Canada to be labelled as such, the product must contain a specific percentage of soilds derived from milk fat. If the product does not meet the requirement, it must instead be labelled as “Frozen Dessert”. With Unilever having shifted many Breyers products from milk/cream to the cheaper ‘milk ingredients’, most Breyers products are no longer “Ice Cream”. As an example, while many might associate Breyers’ ‘Classic’ products with “Ice Cream”, upon closer look, none of them are ice cream at all! Another line of Breyers products is ‘Smooth & Dreamy’? The name evokes images of ‘ice cream’, but alas, most of those products are too, only permitted to be labelled as “Frozen Dessert”. Yet despite most ‘Smooth & Dreamy’ products containing no cream, emblazoned on most of the ‘Smooth & Dreamy’ products is a very visible graphic that reads, “Cream”! How could that be? Some of those products are not legally permitted to be called “Ice Cream” in Canada! Another closer look reveals Unilever’s strategy. 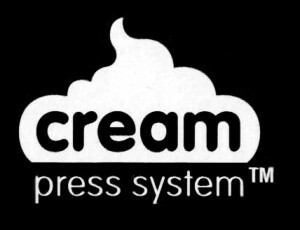 Printed in a considerably smaller text underneath the word “Cream”, is “Press System” – a marketing tactic that apparently signals to the consumer that the product has undergone a unique manufacturing process. This is clearly designed to fool Canadians into thinking they’re purchasing ice cream. Hmmm. Shouldn’t this be against the law? According to Section 7 of Canada’s Consumer Packaging & Labelling Act, it is (at least through our interpretation). It appears the Canadian Food Inspection Agency (CFIA) needs to be contacted by Deconstructing Dinner. But let’s first backtrack to 2007, because this won’t be the first time that Deconstructing Dinner has approached the CFIA with such a question. When Deconstructing Dinner first examined Unilever’s marketing practices in 2007, we directed our focus towards the Breyers brand, and upon our initial visit to their web site, we discovered a marketing tactic that was in direct contravention of Canada’s Food and Drugs Act. Located on the left hand-column of the site was a list of categories, which, among them, was “Packaged Ice Cream”. Yet even though many of the company’s products are only permitted to be labelled as “Frozen Desserts” and not “Ice Cream”, Breyers lumped both lines of products under that same “Packaged Ice Cream” category (as seen in the accompanying image of the ‘Fat Free Cappuccino Chocolate Chunk’ – a “Frozen Dessert” product)! And so in September 2007, Deconstructing Dinner contacted the CFIA who suggested we file a complaint with industry-funded Advertising Standards Canada. Within two weeks of sending the letter, Unilever changed their web site in response to the complaint, and lumped all products under the heading “Frozen Desserts”. So… was this a sign that a large multinational food manufacturer was willing to right a wrong and communicate honestly to Canadians without government intervention? Unfortunately, no, because since that 2007 complaint, Breyers has completely revamped their web site. In its new version, the same old tactics are being used. Greeting web site visitors today is the slogan… “It’s time to love ice cream with the carefree joy of a kid again”. A bit misleading when most of Unilever’s Breyers products are not ice cream at all! In fact, of the 63 different products listed on the Breyers web site, not even half of them are legally permitted to be called ice cream in Canada! The misleading tactics don’t stop there. Despite the ‘Classic’ line of products containing no flavours that are legally labelled as ice cream in Canada, under the web site heading ‘Our Story’, Unilever states, “The Breyers brand has grown significantly in recent years as new products have joined the flagship Breyers Classic Ice Cream line”. WHAT? Earth to Unilever, according to a company of a similar name (Unilever) your ‘Classic’ line is no longer “ice cream”! And so, Deconstructing Dinner will once again file some more complaints with the CFIA on the many above instances of what we would quite comfortably allege to be outright fraud. The history of margarine in Canada is quite a fascinating tale; from initial efforts to legalize the product in the face of intense opposition from the dairy industry, to the more recent Unilever victory to pressure Quebec to remove their ban on yellow margarine, the stories are both sad and funny. But today, margarine’s story is very much being authored by Unilever who produces most of the major margarine brands found on grocery store shelves. Shockingly, all of them sold in Canada are produced within one 12-acre facility in Toronto (Becel, Blue Bonnet, Imperial, Fleischmann’s, I Can’t Believe It’s Not Butter). One of the more recent issues placing margarine in the public spotlight has been the transition that some margarines have made from hydrogenated (and their accompanying and dangerous trans-fats) to non-hydrogenated oils. Unilever has spent considerable time promoting this transition; “Since undertaking its global Nutrition Enhancement Program in 2005,” stated Unilever in a 2009 press release, “Unilever has voluntarily eliminated more than 33,000 US tonnes of trans fat from its food and beverage portfolio.” Hmm. Voluntary? Is that to say that Unilever is being pro-active? Not exactly. The dangers of hydrogenated oils and their accompanying trans fats date back decades. An example of such early warnings can be found within the 1962 book published in Ontario titled, “Margarine: The Plastic Fat and Your Heart Attack”. Those warnings continued with a notable one published in 1981 in the American Journal of Clinical Nutrition. In the early 90s, Harvard researchers sounded the alarm yet again, and in 1998 a study co-sponsored by Health Canada determined that 11% of dietary trans fats among Canadians were being supplied by margarine. But despite the warnings, margarine producers maintained the status quo, continuing to aggressively market hydrogenated margarines to Canadians. That was until the Canadian government finally heard the warnings, when in June 2007 the then-Minister of Health, Tony Clement, took a laissez-faire approach by requesting that food companies voluntarily reduce trans fats from their products within two years. And so while the move away from trans-fats is being labelled as ‘voluntary’ by industry and government, it’s obvious that Unilever is finally submitting to public pressure despite decades of warnings that trans-fats were dangerous to heart health. Unilever’s propensity to turn a blind eye to the many warnings are perhaps best captured in a statement posted on the company’s web site; “For more than 40 years, Unilever has played a leading role in helping consumers maintain healthy hearts”! It would appear Unilever maintains an alter ego… with one personality believing their products are heart-healthy choices, and the other seeking to mislead and deceive! Let’s look at another instance of their deceptive marketing strategies noticed in 2007: Despite the known and fatal effects of the consumption of hydrogenated oils and trans-fats, Unilever was clearly seeking to convince consumers that their line of “I Can’t Believe It’s Not Butter” margarineswere ALL free of trans-fats when in fact they were not. The brand’s U.S. web site was the forum for the deceptive tactics. 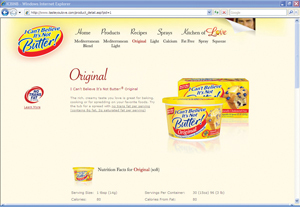 Located on most of the pages of the web site was a “No Trans Fats” logo (see image), leaving visitors under the impression that both the soft and hard margarines were trans-fat free. In reality, only the soft margarine was. Fast-forward to 2010: Has Unilever’s marketing deceptions changed? No. On their web site today is a graphic that reads, “Helping improve the heart health of Canadians”. The graphic implies that consuming Becel translates into a healthy heart. Of course such an equation is incredibly irresponsible. Maintaining a healthy heart or preventing heart disease is the outcome of many factors and not the outcome of one food. The Canadian government agrees. 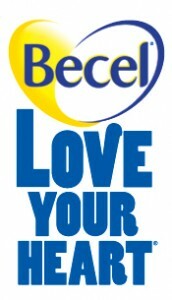 But let’s get right to the ‘heart’ of Unilever’s margarine marketing machine and focus some attention on the Becel logo/slogan itself (which adorned the back page of Synergy in May/June 2010). The logo and slogan achieve one primary goal… to convince consumers that eating Becel is good for your heart. Luckily, gullible Canadians have some protections from companies seeking to lure us into their fictional world where margarine prevents heart disease. Canada’s Guide to Food Labelling & Advertising specifically states in section 8.14 that; “The use of heart symbols to describe a food are generally not acceptable. They may give an erroneous impression that consuming a single food or menu selection will provide heart health or prevent heart disease.” The section continues and as Deconstructing Dinner sees it, also applies to the “Love Your Heart” slogan; “Objection is taken to the use of terms employing the word “heart”, such as “heart beat”, “whole hearted” and “heart smart” to describe individual foods”. Yet some more complaints to file with the CFIA! 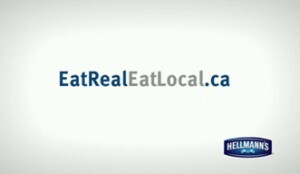 “Eat Real, Eat Local” was the slogan for Unilever’s 2009 Hellmann’s mayonnaise marketing campaign. Looks like big food finally sees $$$ signs in local food… or at least the idea of local food! Despite Hellmann’s mayonnaise being a concoction of mostly eggs and canola oil from completely different parts of Canada, it appears Unilever sought to trick Canadians into thinking otherwise. How “local” is B.C. canola for a Nova Scotian purchasing Hellmann’s in Halifax? And how “local” are Ontario eggs when purchasing Hellmann’s in Victoria? Enter a new term to attach to the marketing efforts of big food… “localwashing”. The only information Hellmann’s provides on their web site as to the origin of their ingredients, is that the eggs are “100% Canadian”! Unilever has since changed their campaign slogan to “Hellmann’s Real Food Movement”. Perhaps a result of their hypocritical “eat local” efforts. The company states that they are committed to five principles, one of which is, “always working with integrity”. With sufficient examples to prove otherwise, it appears that the very posting of that statement of principles is too, just another deceptive marketing campaign by Unilever. Stay posted to the Deconstructing Dinner web site to keep track of the outcomes of our dialogue with the Canadian Food Inspection Agency (www.deconstructingdinner.ca). Largest purchaser of black tea in the world. Unilever has been a major margarine producer since 1878. Between that time and approx. 1960, margarine was produced with a base ingredient of whale oil. According to a 1940 book published about the whale oil industry, Unilever was the largest whale oil purchaser in the world. In one year alone, and of what was reported, floating whale factories processed 6,158 blue whales, 17,989 finback whales, 2,108 humpback whales, and 2,566 sperm whales. Whale stocks became so dangerously low, that a global ban on commercial whaling came into effect in 1986. Unilever was in the frozen fish business between 1957 and 2006 and was accused of purchasing illegally fished cod from Baltic stocks on the brink of collapse. Unilever maintains a long history of purchasing palm oil from plantations which contribute to rainforest deforestation. Unilever India was reported to have illegally dumped mercury waste in Kodaikanal, a heavily-populated town in India in March, 2001. In 2001, Unilever released their Pro-Activ margarine onto the Canadian market without proper approval from Health Canada. This entry was posted on Wednesday, September 29th, 2010 at 10:02 pm	and is filed under FEATURE, MINDFUL LIVING. You can follow any responses to this entry through the RSS 2.0 feed. You can leave a response, or trackback from your own site.